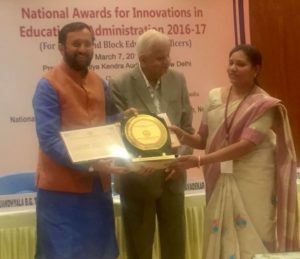 New Delhi: Union HRD Minister Shri Prakash Javadekar today presented the National Awards for Innovation in Educational Administration to the participants here in New Delhi. The Awards have been instituted by the National University of Educational Planning and Administration (NUEPA), New Delhi. Speaking on the occasion the Minister asked the Education officers to act as an important link for achieving the target of quality Education to all. About 150 district and block level education officers from across India and resource persons and faculty of the university were present on this occasion. Shri Prakash Javadekar congratulated all the award winners and certificate holders for their unique innovations. He said for the betterment of students innovative process should go on and there should be an active participation from all quarters related with the task of providing education including parents. The Minister said doing innovation is a life long process and always tends for better results. In this regard he cited the recent achievement of Indian Institute of Science (IISc), Bangaluru, which has been ranked eighth in the list of world’s best small universities. The Minister said the objective of education is to bring out a good human being out of the system. We need to do that and will have to volunteer for it. Shri Prakash Javadekar emphasised the need of upbringing quality leadership in teachers and head masters for reforming the education system. The Minister said government has decided to have a separate cadre of head masters so that a teacher becoming head master at the age of 40-45 will have a chance for another 15-20 years for devoting himself in providing quality education. The Minister also emphasised upon ICT activity, teaching learning experience and accountability. He also stressed the need for improving the quality of teachers. Shri Prakash Javadekar also announced organising of `innovation conventions’ in future at regional as well as at national level where teachers, parents, NGOs, concerned departments and related stakeholders involved in innovation will be participating. The Minster also emphasised upon community participation for better education. He said we have to convey a message about the seriousness of the subject. The Minister said we have to work as a team which is motivated to improve. Shri Javadekar said he is going to reform the whole teachers education system and now the BEd students will have to take lessons in government schools alongwith their evaluation by government school teachers. The Minister said this is necessary for the overhauling of education scenario. The Minister also urged the teachers not to kill inquisitive spirit as every student possesses a unique kind of creativity. He said the teachers need to educate their students in an interesting manner. Engaging education, Interesting education and a system where student can also participate and discuss is necessary and education officers will have to work for this as they are one of the links of achieving our target of providing quality education to all in line with the Prime Minister’s motto of “Sabka Sath, Sabka Vikas”.